We took this picture on Wednesday, 7th March. 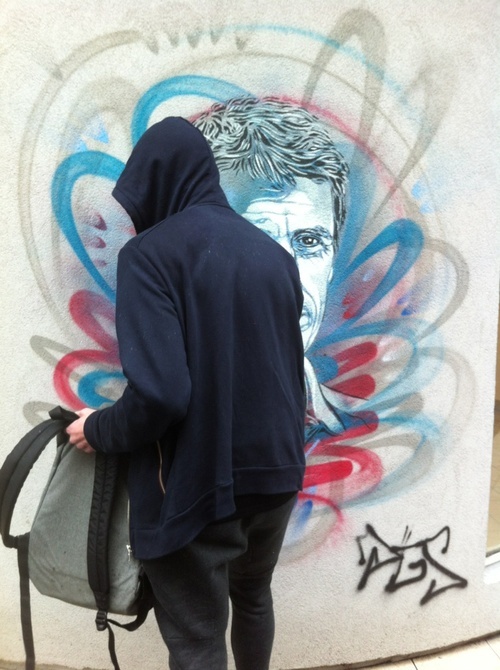 We have chosen this graffiti which is in Caillaux street in 13ème borough. It was made by C215. We've chosen this graffiti because it was close to our school. It shows an old man with a white shirt and a little smile. The graffiti is painted in four colours (blue, red and with a bit of black and white). We decided to represent the graffiti with a man who is taking a flower from his backpack to show his support to a dead man.